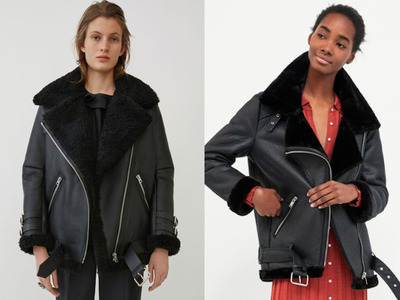 Acne & ZaraAcne’s shearling jacket (left) retails for $US2,700, while Zara’s copy (right) costs $US149. Fashion does not have the same copyright protection as other creative media such as art, literature, and film, which means that fashion designers are vulnerable to having their work copied. Fast-fashion retailers like Zara and Forever 21 are able to mimic designs seen on the runway and have them in stores just weeks later. Luxury designers are now fighting back by offering products for purchase directly from the runway. Zara is quickly becoming the dominant player in main-street fashion. The store has 309 stores in the US, 2,127 in the world, and its parent company, Inditex, is now the largest clothing retailer in the world in terms of sales. This savvy store has been able to rise above its competitors with its constant turnover of on-trend items and ability to give shoppers access to runway styles at cheaper prices. All fashion designers draw inspiration from the world around them and from their competitors, but fast-fashion stores like Zara and Forever 21 are frequently accused of crossing the line between being inspired by a designer and copying the item entirely. Gucci and Forever 21 are currently embroiled in a feud after the luxury brand alleged that the teen retailer had ripped off its signature “blue-red-blue” and “green-red-green” stripes in various items of clothing. Twitter/@TopBeautyIdeasThe $US3,400 Gucci style is on the left, and the $US34.90 Forever 21 style is on the right. This isn’t the first time that Forever 21 has been accused of creating copycat designs. It’s previously faced a host of lawsuits from retailers and designers such as Diane von Furstenberg, Adidas, and Puma. Zara is also often accused of selling copycat products. In 2016, it came under fire after it was accused of allegedly ripping off designs from an independent designer, Tuesday Bassen. In 2012, it was accused of ripping off New York street designer Patrick Waldo, The Huffington Post reported. Forever 21 and Zara did not immediately respond to Business Insider’s request for comment. Fashion does not enjoy the same level of protection as other creative media such as art, literature, and film. This is because, by nature, fashion items serve a purpose, which means they are exempt from copyright laws. “To be protectable by copyright, an item cannot be functional,” Christiane Campbell, a partner at the Duane Morris law firm, told Business Insider. Because of this, “the argument has always been that fashion is not protectable,” she said. There are certain ways to protect a product’s design, but the process to do so is time-consuming and expensive. Retailers can use trade dress trademark laws to protect the visual characteristics of a product: the colour, original pattern, or unique design element, for example, that are specific to that designer or product. Campbell used the red-soled heels at Christian Louboutin as an example. The heels are recognised by the US courts as a defining symbol of the brand and are now protected by trademark law, but this doesn’t happen overnight. “There is acquired distinctiveness, and it takes a lot of time and money,” Campbell said. Plus, it’s not recognised by all legal jurisdictions – in the EU, for example, the signature red soles are not protected. Designers can also file for a design patent, but these are expensive and can take around two years to process. 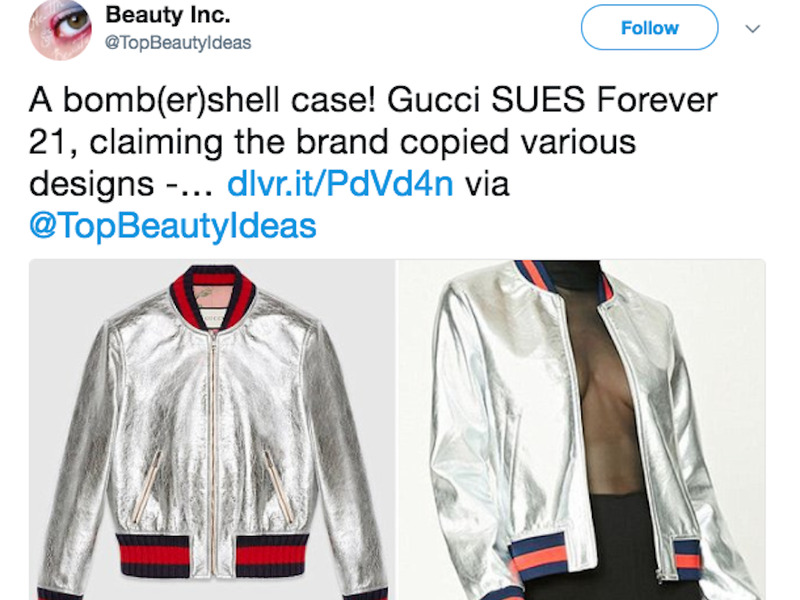 Even if designers do decide to take the option to sue for copyright infringement, this lengthy process is undermined by the speed at which fast-fashion stores can have copycat items on shelves. This means that fast-fashion retailers are less intimidated to make products that are strikingly similar to what’s seen on the runway. “They tend to be pretty risk-tolerant,” Campbell said, explaining that their products are flying off the shelves before a lawsuit even hits. Some retailers aren’t willing to give up without a fight. “Adidas is extra aggressive at protecting trade dress and trade markets,” Campbell said. In 2016, Adidas filed a lawsuit against rival Skechers, alleging that it had ripped off its Springblade running shoe design. The district court ruled against Adidas in 2017. Traditionally, design houses produce two seasonal collections a year, which are shown on the runway and then available for purchase six months later. In September 2016, at New York Fashion Week, designers such as Burberry, Ralph Lauren, and Michael Kors started to embrace the “see-now-by-now” movement that allows consumers to shop styles right after the show is over. Critics say that by mimicking their fast-fashion competition, these designers risk losing their whole ethos, which is to create high quality, well-crafted clothing. “Some fashion pundits believe that the see-now-buy-now movement may lead to designer burnout,” Deborah Weinswig, managing director at Fung Global Retail & Technology, wrote in a note in February 2017.